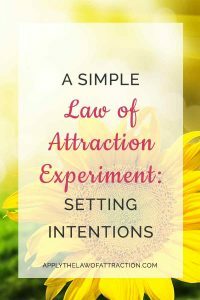 This simple Law of Attraction experiment on setting intentions helps you to learn how you affect the world around you and how you can attract things to you based on your beliefs and expectations. But it's also going to be a fun game to help you learn how quickly the Law of Attraction works when you don't have any attachment to the outcome. 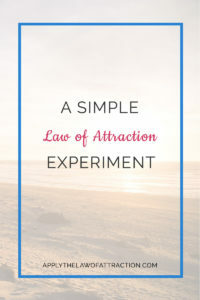 Even though it's a simple Law of Attraction experiment, it can help you to fine tune your mastery of the Law of Attraction, while having fun manifesting with other people. Remember that the world around you reflects back to you your beliefs and expectations. You see what you want to see. Reality is really an illusion that changes to match what you are aligned with in any moment. As your alignment changes, so too does the world around you – the people, the objects, the events… They all match who you are at an exact moment in time. This simple Law of Attraction experiment is designed to help you see how the intentions you set govern what you see in the world around you. It will prove that what you see is what you look for, and that you can find anything you are looking for. When this experiment is done, you will know that you can change the world around you by simply changing what you are looking for. For the next 72-hours, you are going to actively look for one specific item. I've chosen blue birds. You can choose blue birds or something else you prefer – green apples, brown horses, red boxes – whatever suits your fancy. As you go through the next 72 hours, make note of all the blue birds you see. You might see actual blue birds or see blue birds on stationary, in a magazine, on a shirt…anything is possible! When you're done, come back here to report your results. 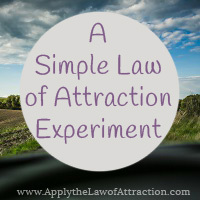 If you want to take this simple Law of Attraction experiment even further, you might watch to check out the free law of attraction course being offered by my friend, Mary Morrissey. She's giving away a ton of information on how to to make the Law of Attraction virtually foolproof so you can get bigger results in far less time than ever before. The formula Mary reveals helped me becomes a Manifesting Machine! Thank you so much for this experiment – I will do it! Actively — for one specific item. I decided to make an intention to see blue birds as well. About 20 minutes later, I was at the gym and two different TVs had two different sports teams playing whose mascots are blue birds. A third TV also showed an ad for an insurance company whose logo is a bird outlined in blue. This was all within 5 minutes of each other! I did this, and got a wonderful manifestafion! It didn’t happen in 72 hours; it happened today. We went to visit a family member today on a very rural area of the state. We originally were supposed to go this weakened, but of nowhere decided yesterday to go today. I was more concerned about all the fowl and dogs on the property and what I to wear of anything. We arrived, and she said how she loves to hang out on the verandah, and she was talking about all the types of birds she gets to see. One of them were blue jays. I thought ah I think it worked, but not quite cuz I didn’t see them. Then, they started soaring thru out trees surrounding the property! This was a great exercise. Reminded me that if may not happen in the time alloted(or maybe I just didn’t put enough feelings to make it happen in the time allotted? ), that it will still happen if I stay at one and let it go. After reading your blog post, I created the intention of seeing butterflies, lots of butterflies, and they had to be quite unusual colours, with some blue in them – it was one of the first images that popped into my head. Didn’t think there would be anywhere I could see lots of butterflies in October in the UK, especially unusual looking ones. Anyway, about 24 hours after I made this intention, I was surfing the internet looking at some home furnishings online, and the lovely table I liked was set against wallpaper. As I looked closer, I could see the wallpaper patterned with lots of butterflies – the majority of which were different shades and patterns of blue. . . . Today I also saw a picture of a woman in a newspaper who was wearing a blouse with lots of butterflies on it . . . though it is now about 4 days after I set my intention, so I’m not sure if that counts. 🙂 Anyway, it has given me hope with regards getting out of my own way when I manifest. Thank you for the advice.